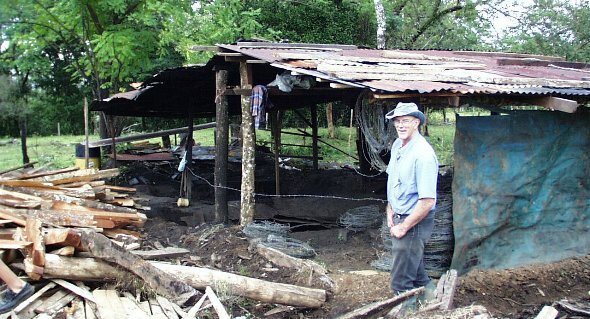 Carbón Bodega: The roof keeps the coaling pits dry so this is an all weather operation. Scrap wood from the local saw mills is coaled and sold for ¢2,300 ($5 US) per ~40 pound bag. 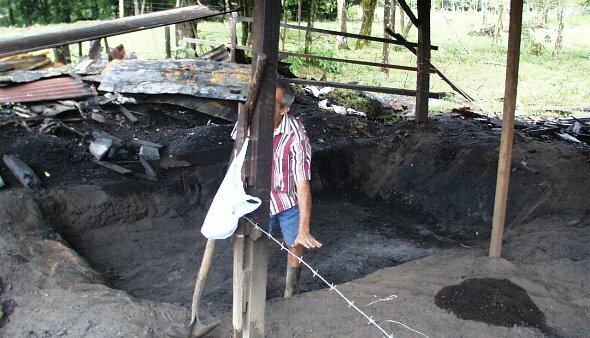 20 bags are made in one pit and it takes about a week. Josh posing for scale. . The Charcoal Burner Mr. Dagoberto explaining the process. Wood is stacked in the pit so high, covered with sheet metal, then sealed and insulated with dirt. A fire is maintained at one end and vented at the other. It is carefully tended night and day for a week. A lot of work for $100 worth of charcoal!